Very few writers are great at absolutely everything from the outset. How did you respond to the opening hand you were dealt? Do you play to your strengths and avoid the rest. If you try to improve, how? I don’t know how others play to their strengths in their writing. I only know there’s always room for improvement. Truman Capote supposedly remarked that Jack Kerouac’s On the Road was “typing,” not “writing.” No matter where you fall on the merits of Kerouac’s work, it’s an interesting take on the way we think about literary invention. Capote skewered Kerouac brilliantly with an affront akin to equating Vermeer with Sherwin-Williams. And while the sense of “writing” as literary or musical copposition is indeed one of the common definitions of the word (number 1b in Merriam-Webster), let’s not forget that “writing” has many other meanings, including “penmanship.” (If you’re keeping track, “handwriting” is definition number 1a for writing in MW.) Having good penmanship does not necessarily make you a good writer. It simply means you’re a good writer. Most languages are written from left to right, which prevents most writers (righters) from smudging the ink that trails behind the hand as it crosses the page. Typing, on the other hand, is agnostic in its handedness. But hand- or typewritten, the resulting literary worth is in the words and ideas, not the method of making marks on paper. 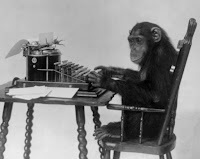 The Infinite Monkey Theory postulates that, given enough time, a working typewriter, and a lot of paper, a hypothetical monkey typing at random will “almost surely” produce Hamlet eventually. Can the same be said of a monkey writing with pencil and paper? Perhaps, but it would probably take longer, and that opens the penmanship can of worms again. All of this is not to say that Kerouac wrote like a monkey, just that the word “writing” or “to write” has more to it than literary connotations. 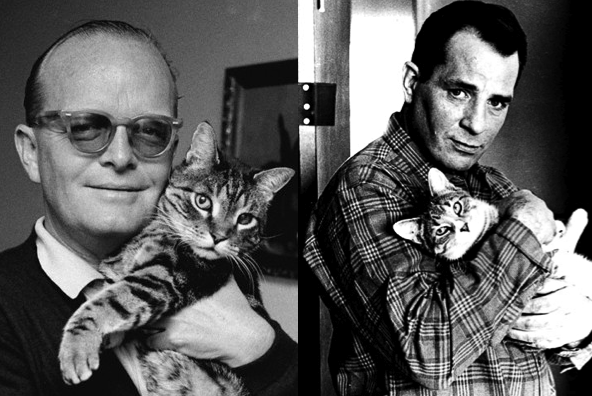 So should Kerouac have been offended by Capote’s snub? Of course he should have been. If he wasn’t, he wasn’t paying attention. Language is so supple, so versatile, so trenchant that, when wielded by an expert, it can cut with a surgeon’s precision. At the same time, it can soothe or inflame, bludgeon or caress. Language is difficult to master, at least with the skill of a William Shakespeare, a Truman Capote, or a clever monkey. But when a writer tames its whimsy and masters its power, we are enriched and inspired. And those who aspire to enrich and inspire with the written word are known as “writers,” whether they achieve celebrity or fail at the outset. What drives us “to write” is not the tapping on the keys or the smudging of the ink (more the lefties than the righties), it’s the struggle to find the word—the right word—that fits the bill and tells a story that might change the world. That’s why we soldier on, learning, not playing exclusively to our strengths but forcing ourselves to reach deeper, until we finally find the voice, the story, and the magic. And when we think that our writing is so profound, so unique that we have indeed changed the world, let us be humble and remember that any monkey, given enough time, can achieve the same result. Hi Jim - words for those of us striving to remain sane whilst following our muse, yet being painfully aware of our limitations...and understanding the fact there's no such thing as "perfection" when it comes to writing (because perfection only exists in the eye of the beholder/reader. Whoops. Maybe I be one after all.